I spent 10 days of this most recent winter vacation on an excursion to the nation of Israel. Knowing I was visiting through the Taglit-Birthright program, a Jewish charity that sponsors young Jews from around the world to visit Israel, I was somewhat wary that there might be an overt agenda to the program, either political or religious. I believed there was a chance this could have intruded on my experience of the trip, and my own impressions of the country. However, although the political and spiritual discussions were present, they were never too obtrusive. I was able to spend most of my time experiencing the culture, witnessing the millennia of history, noticing the nature and documenting it all in the some 1,400 photographs I took during the trip. This is a collection of some of the more notable, memorable or just visually striking sights I had the good fortune of committing to digital memory. My hope was to capture a sample of Israel’s cultural essence, enough that I would be able to portray the sights I saw in the way that I saw them. After a several hour layover in Switzerland, we arrived in Tel Aviv early in the morning. We spent a couple of hours recuperating in a hotel near the Mediterranean coast before catching our bus to the Sea of Galilee. Driving through the streets of Tel Aviv, I was struck first by the variety of architecture, and second by the commonplace nature of so many Jewish symbols. 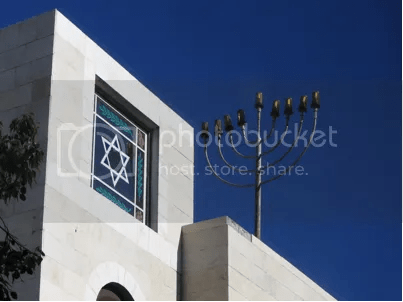 In the above photo, a chanukiah adorns the roof of a synagogue against a vivid blue sky. 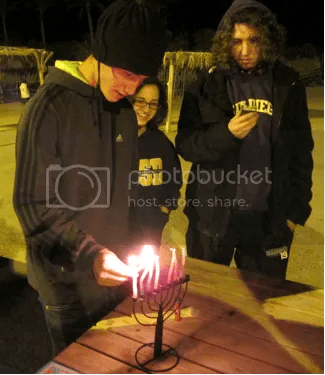 Since it was Hanukkah, there were chanukiahs on almost every street corner and many of the buildings. Throughout the trip, I observed that signs of Hanukkah were as common a motif as Christmas trees and reindeer in the U.S.
One of the first stops we made was a street market. 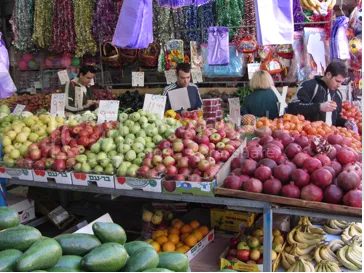 This shot shows the huge variety of colors on display from stall to stall; vendors were selling fresh fruit, chocolates, scarves, jewelry, chocolates and all sorts of curios. The walkways were densely crowded with tourists and locals alike. We spent the first few days of the trip exploring Northern Israel. We stayed at an inn on the shore of the Sea of Galilee, also known as the Kinneret. 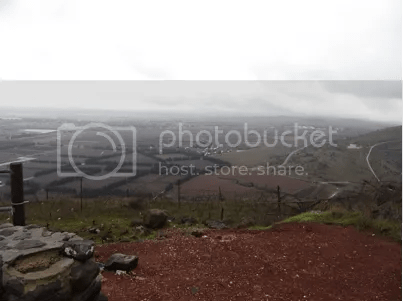 This body of water collects most of the fresh water from the mountains in the Golan Heights, and has historically served as one the primary sources of water for the arid nation. After years of below-average precipitation and increased demand the lake has dwindled dangerously low, leading the Israeli government to turn to alternative sources for water supply, including a major shift to desalination of Mediterranean seawater. 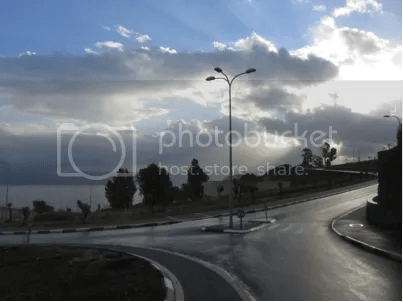 On the way from the Sea of Galilee to the Golan Heights, rays of sunlight broke through the clouds as our bus turned through a roundabout. Israel’s road system is peppered with roundabouts, which hints towards its history as a British colony. 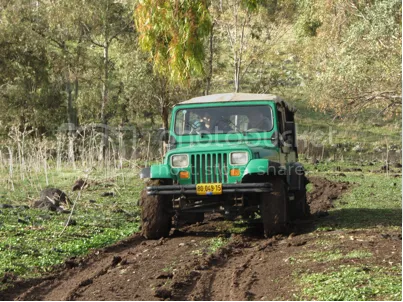 In the Golan Heights we went off-roading in canvas-covered jeeps. On either side of the path were minefields left over from the conflicts between Israel and Syria. The mines are still present today, fenced off behind yellow warning signs because it would be too costly to remove them all. The whole area was so quiet and peaceful that it was hard to believe that just a few decades ago it was a battlefield. Apart from the mine warnings, there isn’t much evidence of the region’s embattled history. 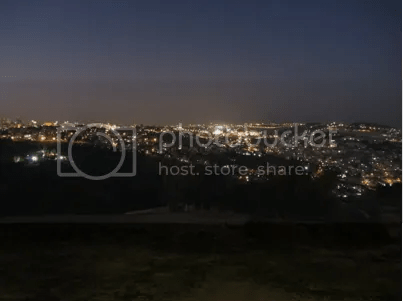 We stopped next at a hilltop overlook where we could see the Syrian border. Even in person it was difficult to discern exactly where it was. The crest of the hill housed an underground bunker, another leftover from the conflict. The bunker was flooded out in some areas (from the recent rain) and no longer contains much more than a few bed frames and tables. These are the cobbled streets of Tzfat, a Northern Israeli city known for its connection to Kabbalah, or Jewish mysticism. 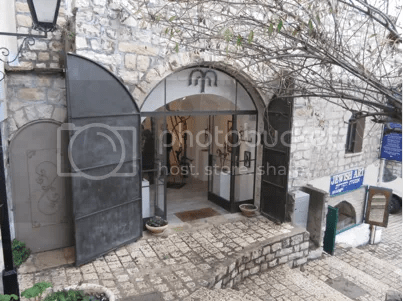 Modern Tzfat is home to a winding labyrinth of cobbled alleyways and staircases, teeming with modern art galleries and delicious food vendors. 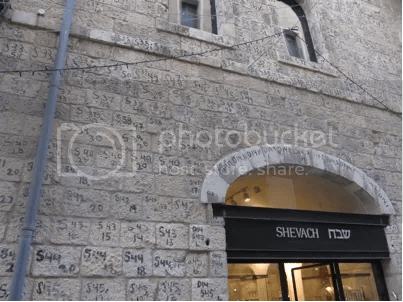 At this point I had visited Tel Aviv, Tiberias, Tzfat and the town of Degania Alef — and it was clear that each town or city had its own character and its own tie to historical events, both ancient and modern. Tzfat’s white stone walkways really showed how each locale had a signature visual and architectural style. Our next stop on a whirlwind bus tour of Israeli sites was the city of Sderot, near the Gaza Strip. Rockets from the Gaza Strip have been fired frequently into Sderot over the last decade or so. 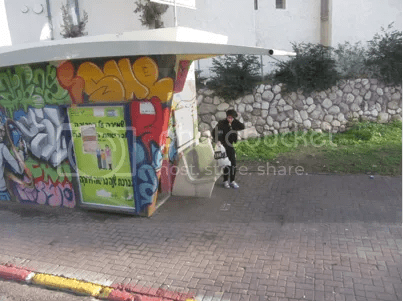 As a result of this constant threat, shelters have been constructed or repurposed all over the city, and now citizens of Sderot are never more than several seconds away from shelter in case of emergency. Seen here is a dual-purpose bus stop and bomb shelter. Regardless, daily life goes on and many of the shelters are artistically designed and colorfully decorated, turning a security necessity into public art. 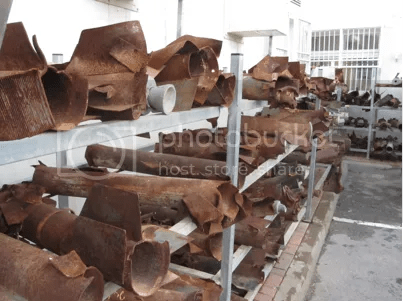 Stored on rack after rack were the twisted rusty remains of dozens of the rockets that have landed in Sderot over the last decade. These missile casings are also repurposed as part of the public art projects, welded and reshaped into statues and sculptures that can be seen in various places around the city. 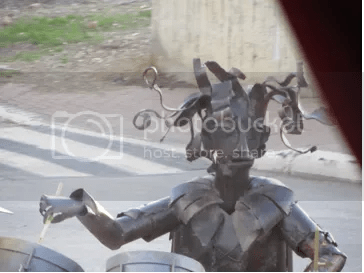 Debris, shrapnel and rockets are all collected and made into pieces of art, such as this sculpture of a drummer. 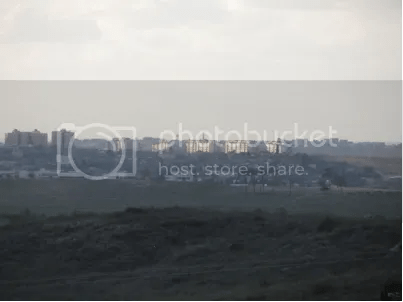 Looking out from the edge of a Sderot neighborhood we can see the border with the Gaza Strip. Buildings in Gaza City caught the late afternoon sun. Aside from the undeveloped land, between it is difficult to pick out exactly where Israeli territory ends and Gaza territory begins. Bedouins leading camel caravans across the desert. 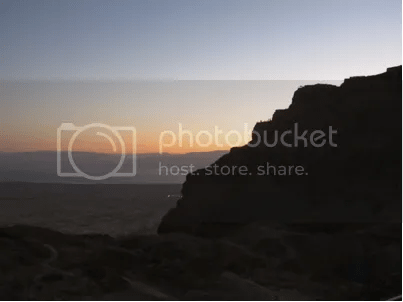 We rose early to visit the historical site of Masada, a fort built by Herod the Great over 2,000 years ago on top of a mountain surrounded by steep cliffs and valleys. Famous for its role in the siege and ‘last stand’ of the Jewish-Roman War of the first century, Masada is seen here silhouetted against the early morning sky, with the Dead Sea and the mountains of Jordan behind. One side of the fort still shows the ramp and trail used by the Romans in their siege. 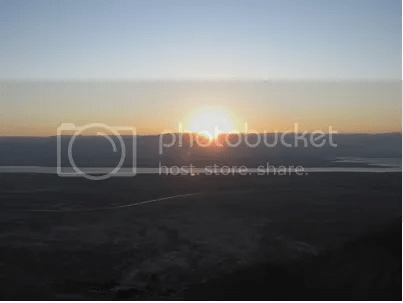 We hiked up the side of Masada to the fort on top and watched the sunrise over the mountains, reflecting off of the canals around the Dead Sea. 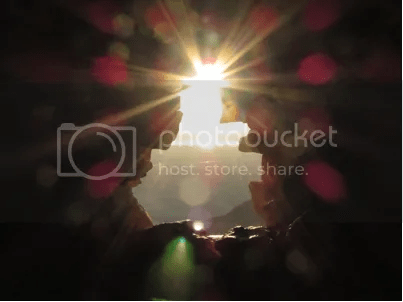 A morning burst of sun seen through a window in one of the rooms atop Masada. 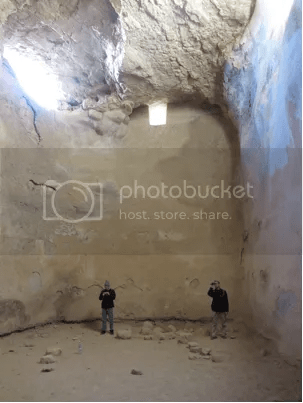 Two members of our party standing at the bottom of a chamber that originally served as a large-scale cistern, showing that water challenges have been innate to the region for as long as people have lived there. In antiquity, water was channeled from the mountains to the west down a complicated irrigation system into the fort where it gathered in several cistern chambers like this one to supply the city. After we explored the northern and south central portions of Israel during the first leg of our trip, we spent a few days in Jerusalem. Here the city lights illuminate the sky at dusk on our first evening in the city. Jerusalem had a different feel from other Israeli cities. The contrasting union of ancient and new was everywhere; the walls of the Old City are right across the street from beautiful and modern-looking temples. Everything that Jerusalem is today was built on top of everything it has ever been. Much of the Old City of Jerusalem is not original, due to the numerous times the city has been ransacked or destroyed throughout history. Because of this, the current level of the city sits on top of layer after layer of history, going back thousands of years. 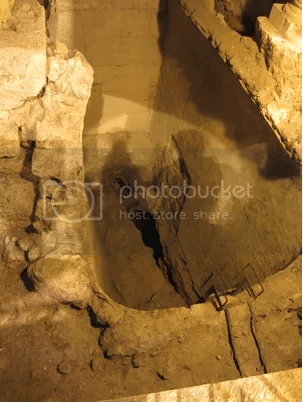 Here we can see an excavation in the Old City revealing at least two previous street levels from bygone historical periods. 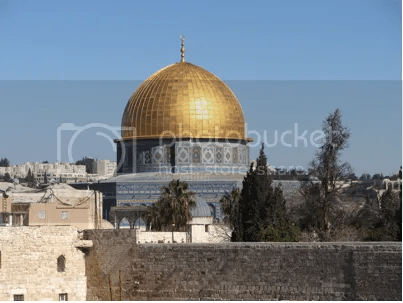 The golden structure of the Dome of the Rock adorns the Temple Mount in the Old City. This gleaming site is probably one of the most familiar landmarks of Jerusalem due to its significance to Islam. The Temple Mount overlooks another internationally famous site, the Western Wall. 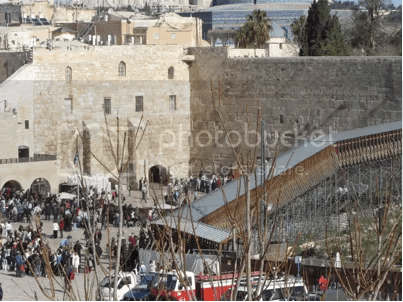 This shot shows the Western, or Wailing Wall alongside the walkway up to the Temple Mount. Throngs of people watch for an opportunity to approach the base of the wall to pray, meditate and perhaps place a note or a prayer into one of the already overflowing cracks between the stones of the wall. Not far from the exit to the Western Wall, many orthodox Jews gather to collect tzedakah, small donations of spare change from passersby. 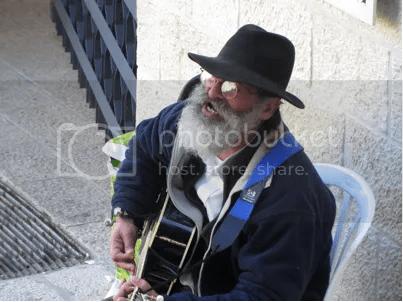 Rather than standing in the walkway, this man was sitting in the shade off to the side, strumming his guitar and singing in Hebrew. 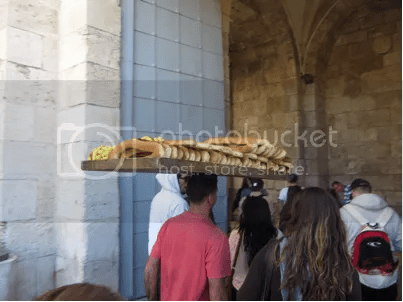 When we first entered the Old City of Jerusalem, I caught this shot of one of the food vendors heading in with a huge platter of challot and other breads balanced effortlessly on top of his head. With Hanukkah over, I began to notice the chanukiah that were everywhere were now being taken down and disassembled for the year. 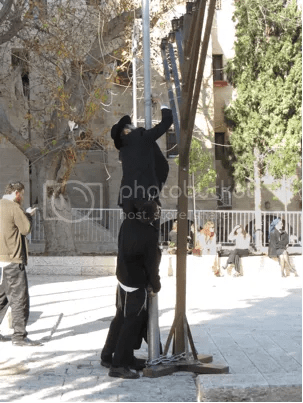 Here an orthodox Jew stands on another’s shoulders in order to reach the straps to take apart this Old City chanukiah. 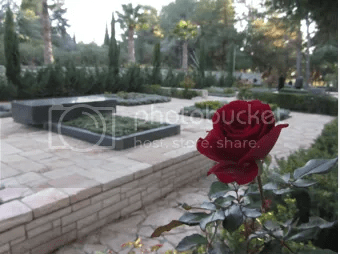 The photos above and below are from the Mount Herzl Israeli National Cemetery, where prominent national leaders, zionists such as Theodor Herzl and fallen soldiers are buried. 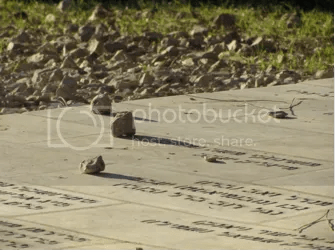 The top picture shows a few small stones placed on a gravestone, a traditional Jewish act of remembrance. This shot was taken in an outdoor shopping mall near the Old City of Jerusalem. Every stone in the wall on this side of the mall is marked with a number. The entire wall was taken apart, moved a short distance and reconstructed to make way for wider roads on the other side. Just like the older parts of the city, even newer architecture finds itself being adapted and reorganized as time passes — an inescapable truth when a city is thousands of years old. 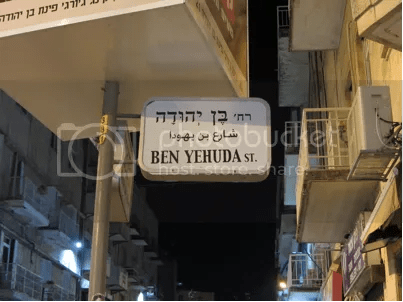 We spent New Year’s Eve exploring the shopping district of Ben Yehuda Street in downtown Jerusalem, home to many souvenir shops, cafés, food vendors, clubs and restaurants. The “fast food” of the region is schwarma, or falafel for the less carnivorous customers. Grilled meat or falafel typically combined with vegetables, and even French fries at some vendors, wrapped in a pita and served warm. 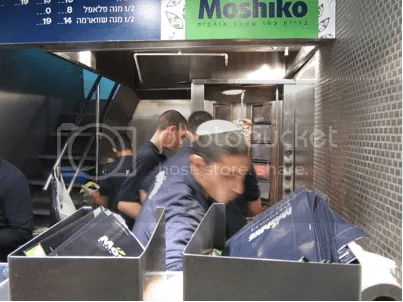 I ordered falafel on Ben Yehuda Street and my server was so quick, my camera just couldn’t catch him, despite my several attempts. Israel officially follows the Jewish calendar, so New Year’s there falls on Rosh Hashanah in autumn. 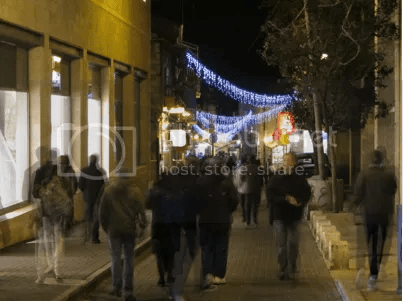 As a result, December 31 passes by without much fanfare in Israel, except among the tourists. Ben Yehuda Street was quite busy on New Year’s Eve, but the vast majority of the shoppers were tourists visiting from abroad. After New Year’s, we left Jerusalem and returned to Tel Aviv. 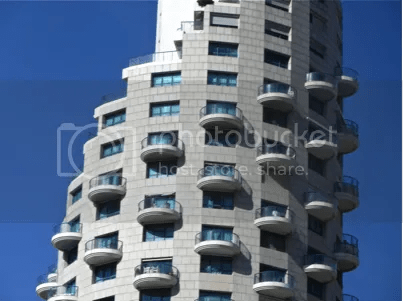 Tel Aviv is a strikingly young city when considering the average age of any other settlement in Israel, or indeed the Middle East. Tel Aviv was founded by a community of 66 Jewish families a mere 103 years ago (at time of writing) outside of the nearby city of Jaffa. With barely a century to work with, Tel Aviv has quickly grown to become a major economic, cultural and technological center in Israel. Tel Aviv has been an anchor for the Jewish community of Israel since its founding, long before Israel was a nation. As such, walking around the neighborhoods of Tel Aviv, you can notice features like these stars of David engraved on balcony supports — little architectural details that reveal the cultural heritage at the core of the city. 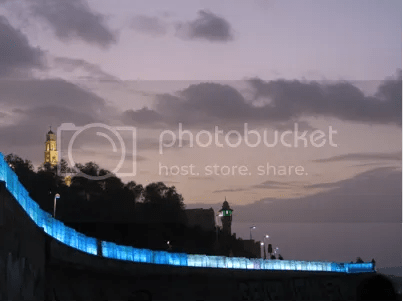 On our last evening in Israel, we strolled along the illuminated boardwalk of the city of Jaffa, before loading back into the bus and returning to our hotel to collect our luggage for the long flight back to Los Angeles. Reaching back into history while forging into a new millennium; a technological haven, and a world spiritual center; arid and dry, but fertile and productive; haunted by conflict, yet culturally vibrant. The land of Israel abounds with opposites that seem to both tear it apart and hold it together. I didn’t have any particular expectations before visiting Israel. I knew of the conflicts, and I was familiar with some of the sights and landmarks we would be visiting. I just wanted to explore and observe an unfamiliar place, as I would when visiting any country. What stood out about Israel as a country and a destination was its contrasts — between its cities, its people, the old and the new. Israel stands at a nexus between humanity’s ancient past and technological modernity. Even as disputes and conflicts continue over the fate of this small yet significant region, Israel exists as a land of unified contrasts, a land where old meets new. David, this is by far one of your best articles. I can tell that you really like travel writing! Great article David, one of your best. You are a natural travel writer! Thanks David for sharing your wonderful experience with us. I know your Mom from Sisterhood at TAS and presented your sibling with the B/M gifts from the Temple last year. I was very impressed with your wonderful photography and descriptions of what you visited from your recent trip to Israel. Great pics and nice write-up. Thanks for sharing your trip.